I’m always torn, when reading anything by Catherynne M. Valente, between feeling just incredible awe at her skill as a wordsmith and storyteller and being overcome by crushing feelings of inadequacy and self-loathing because she’s so brilliant and talented and only a couple of years older than me. I’m always happy when she’s written something new, and Radiance was perhaps my most-anticipated novel of 2015. Even better, it’s everything I dreamed it would be. The most wonderful thing about Valente’s work is that it’s all the same, but also that it’s all remarkably different and unique. Radiance is like nothing I’ve ever read before, but it’s also very reminiscent of Valente’s other recent work. Earlier this year, I read her novella, Speak Easy, and Radiance has much in common with that shorter work, to the point where I get the feeling that both stories grew out of some of the same research. What is certain, though, is that these two works represent a sharp shift in Valente’s adult work. 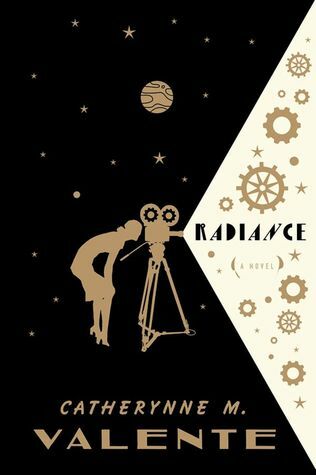 Radiance, in particular, seems to represent a decided shift away from some of the author’s fairy tale themes, in favor of gothic romance, noir, and proto-sci-fi influences. Valente’s work has always skewed literary and is often avant garde, and this is her most ambitious and experimental (or at least most successfully so) novel yet. In Radiance, Valente eschews traditional prose forms in favor of presenting the story in the form of found objects: newspaper clippings, movie scripts, interviews, and so on. While this decision can be occasionally frustrating and even confusing at times (mostly in the first third of the book), it pays off in the end as Valente creates a haunting portrait of a mysterious woman that also functions as a love letter to a part of cinematic history that many readers may not be familiar with. Radiance is a masterpiece of non-linear storytelling, and Valente deftly weaves together numerous threads to build a world that is beautifully surreal and create characters who are wonderfully compelling. Every detail Valente includes works towards the overall effect of the book, which is whimsical and melancholy and epic in scale and deeply personal all at once. There are no words to adequately encompass any Valente novel, though. You’ve simply got to read it for yourself. When you do, I highly recommend opting for print over the ebook, as this sort of found object style is highly tactile and benefits from being read on dead trees. My only complaint is that Tor Books didn’t print the book particularly well. It’s fine, and I do love the cover, but the interior design is average at best. I would have loved to read this in a format that utilized page layout and typography to enhance the reading experience. It would have been just that much more magical.